But before you break out the cream cheese, Devizes cheesecakes are not what you’re probably expecting. The original recipe was actually a helpful way for cooks to use leftover cake, combining the crumbs with a custard base and pouring it all in a pastry shell. It’s like a smoother, creamier, cake-ier bread pudding—not your typical New York cheesecake, but I’ll take it any day. You might be asking, “Who has leftover cake?” and to that I say: good point. But this is the perfect recipe to rescue those mistake cakes: the fallen, the dry and the flavorless. Tamar Adler, in the delightful An Everlasting Meal, has a chapter on turning kitchen wrongs into rights, and this takes a page from her book. Brown butter, nutmeg and cinnamon can hide a multitude of pastry sins. 1. Preheat oven to 375°F and grease 6 ramekins (6-ounce size). Roll out 1 sheet thawed frozen puff pastry on a lightly floured surface into a 12” x 15” rectangle. Make 6 circles, about 5” in diameter, on pastry. Cut out circles, press into ramekins, and prick all over with a fork. Refrigerate. 2. In a small pan, stirring constantly, melt butter over medium heat until it is golden brown. Set aside to cool. 3. Dissolve rennet tablet in 2 tablespoons warm water in a small saucepan. Over low heat, add milk and sugar and stir 5 seconds, just long enough to get the sugar off the bottom of the pan. Using a kitchen thermometer, cook without stirring until mixture reaches 98°F. Remove from heat and cool 5 minutes. 4. Remove ramekins from fridge. Stir egg, cake crumbs, nutmeg and cinnamon into milk mixture. Stir in brown butter. Spoon filling into ramekins and bake until pastry is golden, about 25 minutes. 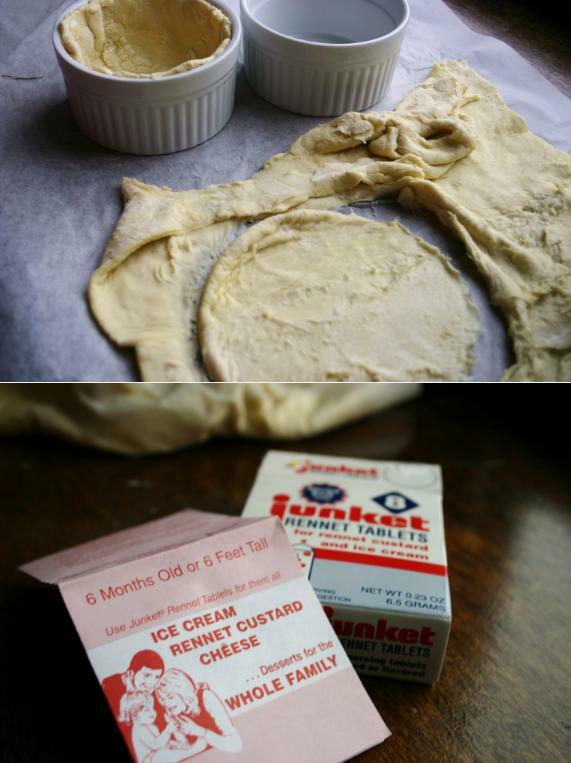 ** Rennet is used for cheesemaking and gives this pudding its custardy consistency. You can find it in specialty groceries or most Whole Foods Markets. Check with the cheese counter if you can’t spot it. Perhaps I shall make Brown Butter Bread PUdding Tarts for my next knit-night gathering! Oh my gosh, Jane Austen and knitting – another two of my favorite things! I’ll have to make something, and then wear it while eating these cakes … but my head might explode with too many amazing things. Delighted to see Austen make an appearance on your blog! I just started Mansfield Park (for the first time, if you can believe it) and have always been a fan of her clever writing. This recipe fascinates me, since you’re essentially making your own cheese within the recipe. I work at a specialty food store, and we get asked for rennet all the time, though we don’t sell it. I’ve been meaning to source some out for cheesemaking, so when I do, I’ll set a tablet aside to try this recipe, too. It look me a little while to find it – my favorite market that has everything couldn’t help me, so I had to go on an expedition. I’d love to hear how yours goes … and now I need to do something with all these other tablets I have! Thank you for the most interesting blog I read and reread! All the articles you write and the recipes keep inspiring me to seek out authors for further perusal and try your wonderful recipes. Thank you! I also am a master knitter and I’ve knit plenty in the style of Jane Austen’s fashion time as knitting history is also a passion. You are so sweet – thank you! I love how I can meet fellow knitters here as well. It seems like we all share similar loves. I just wanted to tell you how excited I am to find this blog. It’s absolutely lovely, and I’ll be following from now on. Thank you, Anna! So glad you’re enjoying it. another great post! i’d never heard of these cheesecakes and enjoyed reading about them! Thanks so much! Apparently the people in Devizes started making them popular again fairly recently – enough so they were mentioned in Saveur. 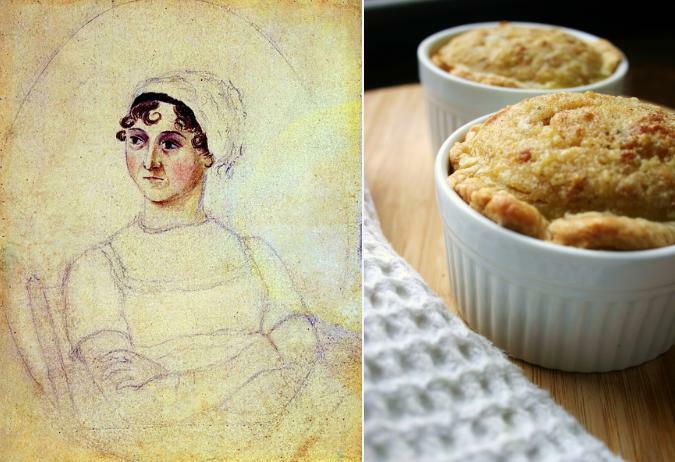 There’s been a little Jane Austen renaissance, I guess! I’ve been a silent reader on your blog for a while. Books and food are my major loves, but I had to say something when my all time favourite author comes up. Jane has always been a love of mine. Thank you for this amazing lovely blog. I’m always excited when someone connects enough with the author/recipe to write – thank you, Mikey! I got to read your blog today and that cake looks delicious – I’m a chocolate fiend and a longtime Lebovitz fan, so I’ll be making it for sure (with the orange!). Thanks for reading. Are you familiar with Miss Darcy’s Library? https://missdarcyslibrary.wordpress.com/ – I hear certain resonances in some of your posts to her style. Looking forward to reading yet more!